Luna Luna magazine's Lisa Marie Basile shares inspired spells, rituals, and practices, including: A new moon ritual for attracting a loverA spell to banish recurring nightmaresA graveyard meditation for engaging with deathA mermaid ritual for going with the flowA zodiac practice for tapping into celestial mojoA rose-quartz elixir for finding self-loveA spell to recharge after a protest or social justice workThese 100 spells are ideal for those inexperienced with self-care rituals, as well asexperienced witches. They can be cast during a crisis or to help prevent one, to protect loved ones, to welcome new beginnings, to heal from grief, or to find strength. 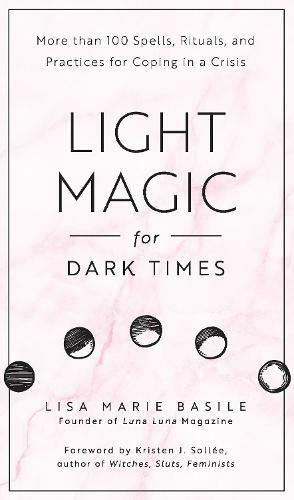 Whether you're working with the earth, performing a cleanse with water or smoke, healing with tinctures or crystals, meditating through grief, brewing, enchanting, or communing with your coven, Light Magic for Dark Times will help you tap into your inner witch in times of need.